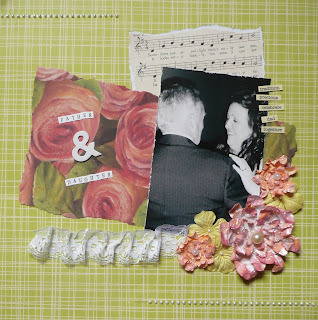 Belinda Griffin: First DT Layout: Love Sprinkles! Well I have been a bit quiet of late, getting ready for Daniel's parents to visit on the weekend, job hunting, etc. But I am super excited to be able to share my first DT layout for A Day in the Life of Renee with you! Honestly everyone should check out http://www.sprinklesbyrenee.blogspot.com/, the store that sells the awesome flowers aka Sprinkles! And I think they are soooo well priced, go and check it out for yourself, I dare you! And now here's my layout! (Check out the gorgeous peach flowers, they're the Sprinkles). The Sprinkles were just too pretty to add too much around so I've kept my layout simple. The photo if one of my faves from Mum's wedding last year, of her dancing with her father. So cute. Now make sure you check out www.adayinthelifeofrenee.blogspot.com for the rest of the DT's layouts and the challenge in the coming days!! Hope to see a few of you entering.